With summer trips ahead, Little Passports is sharing some great tips for traveling with little ones. Which means, less “are we there yet?” and more time for mom and dad to enjoy the laughter, or occasional silence as they hit the wide-open road. Fearing that crammed flight or 4 hour car ride? You don’t have to! 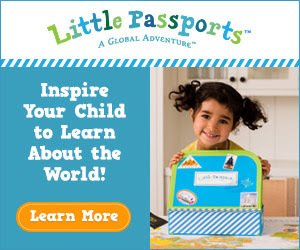 With Little Passports’ simple checklist of helpful ideas, parents everywhere will be celebrating this once dreaded topic of discussion and even looking forward to their next destination. It gets better! Once you have reached grandma’s house or that beach cottage on the coast, Little Passports makes it a breeze to keep the kids entertained for hours with the easy-to-do and educational activities included in their subscriptions. Sign up for a 3 or 6 month subscription (USA or World Edition) for just $13.95! and kids will enjoy taking a break from the TV to explore the world from the comfort of anywhere.